We got away about 40 minutes later than planned.. not too bad. The day was clear but cool. Perfect for cycling. Once we got out of the Salinas Valley the wind was not a factor. We ate lunch on the banks of the Pajaro River, which had a lot of water in it, more than we expected this time of year. We had a surprise in Aptos. From a passing car there was some yelling and waving, the car pulled over ahead of us and it was our friends Ola Faus, her daughter Jessica, and Jessica's boyfriend. They just happened by at that time and Jessica recognized us by Belinda's pigtails. Well that was some fun. 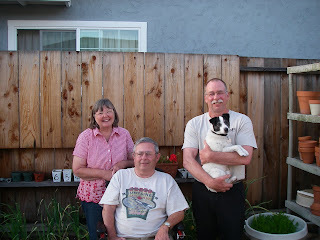 We continued on into Santa Cruz where we stayed with Dave's cousin Donna and her husband Rob. Donna is the historian in Dave's family so it is always interesting to visit with her. She and Rob are very gracious hosts, their hospitality made the perfect close to our first day on the road. Donna & Rob look great!